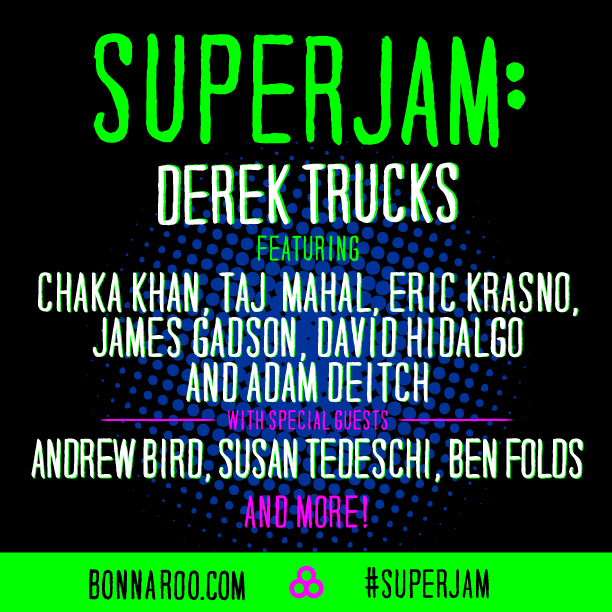 We're thrilled to announce that Derek will host Superjam - "the most highly anticipated Bonnaroo concert tradition and the festival’s signature event" - at this year's Bonnaroo Music and Arts Festival! Featuring Chaka Khan, Taj Mahal, Eric Krasno, James Gadson, David Hidalgo and Adam Deitch, along with special guests Susan Tedeschi, Andrew Bird, Ben Folds and many more, this will be one of the most exciting shows of the summer. For details and ticket info, visit the Bonnaroo site.